Due to a combination of seasonality and heightened competition from Android device makers, shipments of Apple's iPad may see a year-on-year drop for the first time since debuting in 2010, says KGI analyst Ming-Chi Kuo. In a note to investors obtained by AppleInsider, Kuo said that overall iPad shipments will experience a quarter-to-quarter decline of 20 to 25 percent, or 10 to 15 percent year-on-year, for the second quarter of 2013. The analyst based his prediction on sell-through, which is expected to hit 14 to 15 million units for the three-month period. The dip shipments is thought to be a result of a glut of cheap Android tablet offerings this year, as well as a high comparison base from 2012 when the third-generation iPad launched. Driving the decline is lowered iPad mini shipments, which are believed to see a roughly 40 percent quarter-on-quarter drop. Overall, Kuo forecasts a sell-in of around 12.7 million units for the three month period ending in June. Breaking the numbers down by model, the iPad mini is expected to see 6.2 million units shipped, while the latest fourth-generation iPad will see 4.5 million units. 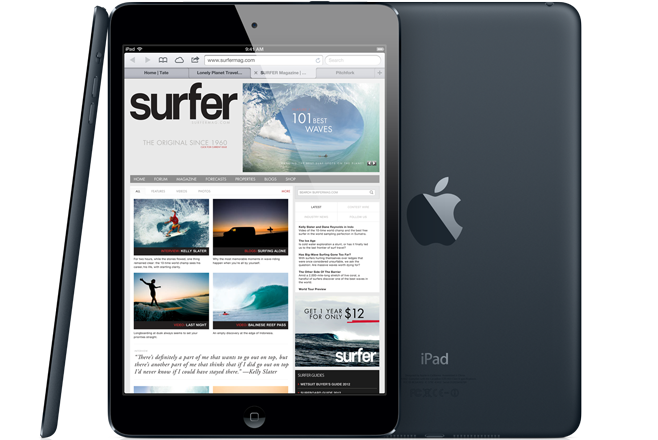 The entry-level iPad 2 will likely come in at around 2 million units shipped. Finally, Kuo notes the third quarter will see growth as seasonality and an expected launch of a fifth-generation iPad boost shipments to first-quarter levels. However, the analyst points out that success is highly contingent on how attractive the supposedly slimmed-down "iPad 5" is to consumers. A recent study conducted by IDC saw the iPad's share of the overall table market dip to 40 percent during the first quarter of the year. Year-over-year growth was still positive at 65 percent, but rival manufacturers Samsung and ASUS saw their share of the sector jump 283 percent and 350 percent from the year ago period, respectively.